At Sovereign Sports we have many years experience of constructing tennis courts in many different surfaces to suit our clients individual requirements. Whether you’re looking for a new tennis court to be constructed or you’re looking for your existing court to be resurfaced then get in contact today so we can discuss the options available to you. Click on the surface type to find out more information. Open textured porous macadam is by far the most popular tennis surface around today, installed in private homes, schools, clubs and public parks across the U.K. The hard, flat surface means the path of the ball is fairly predictable and the speed of the ball is medium to fast, allowing for all standards of play. 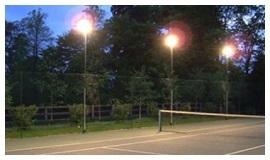 These benefits, along with the low maintenance involved, makes it the preferred for both tennis and multi use games areas. 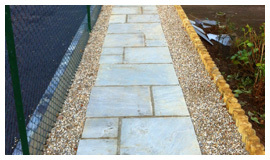 Our all weather porous open graded macadam, specifically designed for tennis is laid on a dynamic stone base, which can be left in the black or more commonly installed with a colour sprayed acrylic paint finish. There is also the option of double layer macadam, which comprises of a base course macadam and has a slightly larger aggregate in the macadam. This provides a solid and uniform base, to receive the top layer macadam. All our installation teams are highly skilled at hand laying our specialist tennis court macadam to provide an impeccable standard of surface. 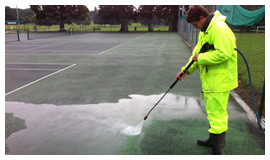 We would recommend where possible, to avoid any trees, foliage or hedges in close proximity to the court area, as bird droppings and leaves on the macadam will seriously reduce the life span of the surface. Open textured porous macadam is free draining to clear quickly of water following rainfall. The Acrylic paint coating is usually applied around 3 weeks after the macadam has been laid. This is to allow the surface sufficient time to cure. Our Grey Green surface is a semi-loose type of tennis court. Constructed using numerous coatings of bitumen emulsion and stone getting finer towards the top of the surface. The surface is a light greyish green in colour, although becomes darker when wet. It is also very easy on joints as it is slightly sprung under foot due to the layering of the bitumen and stone. Also unlike the macadam surface, when turning it provides not such an intense grip under foot and therefore puts much less strain on the feet, ankle and knee joints. We recommend this kind of surface usually for private use, and where there is not going to be such intense play as clubs and schools. It is very low maintenance, and should last between 10-15 years. Construction for a tennis court with this kind of surface is between 3-5 weeks. 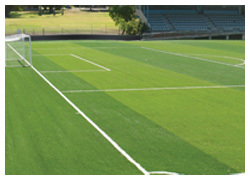 We install a wide range of synthetic including synthetic grass surfaces and more, sourced directly from Playrite Ltd, who are world leaders in the manufacture of artificial grass for all kinds of use including tennis, netball, volleyball, hockey, football, cricket and golf. There are various different styles of carpet in terms of pile height, texture, construction material, and in-fills. For example certain synthetic grasses use silica sand in-fill, others use rubber crumb and some have a combination of both. All this depends on the kind of sports going to be played. There is a vast array of surfaces available on the market today which we are able to supply, but if you have anything particular in mind which is not on our website please don’t hesitate to contact us. Below there is a selection of are our most popular synthetic surfaces along with details of the construction style / materials, infill and play characteristics. 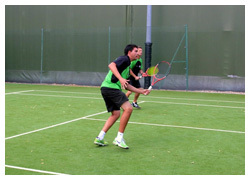 You can also find more information on our dedicated synthetic courts page. A short pile sand filled surface, that has been designed to replicate a clay court in both appearance and playing characteristics. This is an all weather synthetic clay court which provides a medium to slow pace of play. The surface speed, ball bounce and player enjoyment compares with traditional clay. The surface comes with lines inlaid and requires much less maintenance than natural clay, allowing for all weather usage. Artificial clay courts respond well to all types of spin and is suitable for all levels including tournament level play. 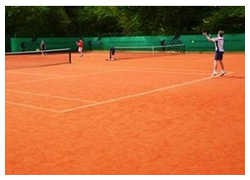 For more information on artificial clay courts see our dedicated page. 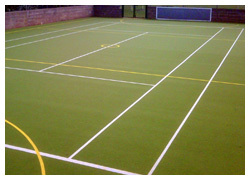 Matchplay 2 is an excellent multi sport surface and offers a more natural feel compared to other artificial products. Being sand dressed, the performance characteristics are evident from day one and play can commence almost immediately. 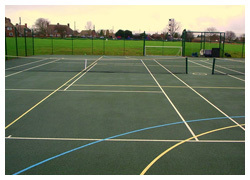 Matchplay 2 is an ideal choice for multi use games areas and can offer high performance and durability for a range of sports, particularly netball and tennis. The built in cushion layer makes for medium-paced play and is easy on player’s leg joints. Inlaid lines can be permanently added in white, yellow, red and blue. 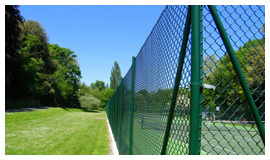 High level porosity, low maintenance and all weather usage are an added value, which in return maximises playing time. Meets FIH, FIFA 1 Star equivalent, IATS performance standard and EN15330 Part 1. All surfaces need regular maintenance to retain good condition, whether it is porous macadam, synthetic clay, synthetic grass.